When Does a Shark Need Camouflage? Using light to hide in the dark might sound like a foolish thing to do, but consider this; when you’re swimming at the bottom of the deep ocean and you look up, what do you see? Light. A dim, glowing blue light filtering down through the water from the surface. And, seen from below, that’s exactly what the smalleye pygmy shark looks like. Its glowing blue belly blends in. The tiny shark uses light organs called photophores on its belly to create light. When it wants to turn off the light, pigment cells in its skin darken in front of the photophores. It’s like pulling shades on a window. Other sharks use this type of bioluminescence, too. In fact, ten percent of the 400 or so known species of sharks can produce this kind of light. 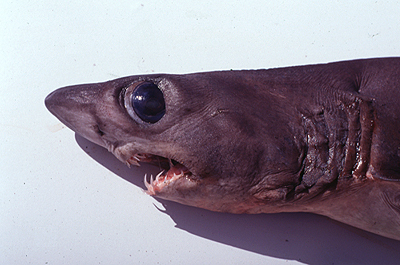 Some, like the two-foot long lantern shark can also use their photophores for communication. They flash their lights like a signal beacon to let potential mates know where they are. Big sharks like makos and great whites don’t use photophores. After all, they’re not too worried about predators from below. (Their only predator is man.) However, they are concerned about keeping it on the sly when they’re hunting prey. For them, “countershading” seems to be enough camouflage. Their topsides are dark so that when they’re swimming beneath you, or some tasty fish, they blend in with the darker water below. When they’re menacing prey from above, the light underbelly is supposed to make it harder to notice that terrifying shadow up near the surface.